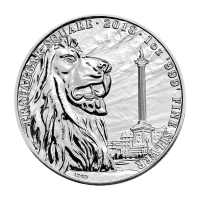 Purchase your 5 oz 2018 Niue Double Dragon silver coin from our store today to enjoy the best price online. The Asian dragon is an ancient symbol of power, luck and strength and has been a familiar feature of Chinese life since the founding of the Han dynasty. 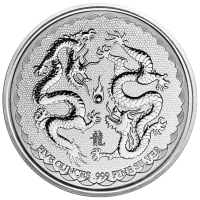 The coin's reverse features two immaculately realized dragons in pursuit of a flaming pearl, set upon a light catching field of dragon scale design. 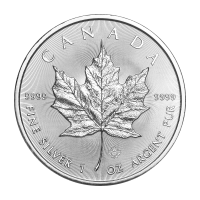 Also on the reverse is the coin's weight and purity. On the obverse, Ian Rank-Broadley's incredibly detailed portrait of Elizabeth II, each aspect crisp and clear, down to the individual jewels of her crown. Joining this effigy on a field of dragon scale design, the names, 'Elizabeth II' and 'Niue,' as well as the coin's denominational value and year of issue. The flaming pearl featured on the reverse is almost as common a symbol as the dragons in Chinese culture and represents the elusive properties of wisdom, spirituality and prosperity. Secure your own prosperity today and fortify your holdings with a 5 oz 2018 Niue Double Dragon silver coin today! 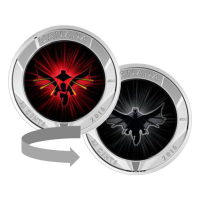 The coin you receive will come in a mint provided coin capsule. وجه العملة تمثال من تصميم إيان رانك برودلي للملكة اليزابيث الثانية بالإضافة إلى العملات فئة 10 دولارات والسنة. تمثال من تصميم إيان رانك برودلي للملكة اليزابيث الثانية بالإضافة إلى العملات فئة 10 دولارات والسنة. 5 أوقية 2018 من العملات الفضية ثنائية التنين خاصة بنيوي Purchase your 5 oz 2018 Niue Double Dragon silver coin from our store today to enjoy the best price online. The Asian dragon is an ancient symbol of power, luck and strength and has been a familiar feature of Chinese life since the founding of the Han dynasty. The coin's reverse features two immaculately realized dragons in pursuit of a flaming pearl, set upon a light catching field of dragon scale design. 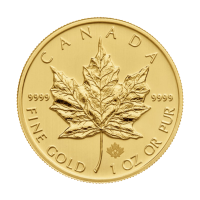 Also on the reverse is the coin's weight and purity. On the obverse, Ian Rank-Broadley's incredibly detailed portrait of Elizabeth II, each aspect crisp and clear, down to the individual jewels of her crown. Joining this effigy on a field of dragon scale design, the names, 'Elizabeth II' and 'Niue,' as well as the coin's denominational value and year of issue. 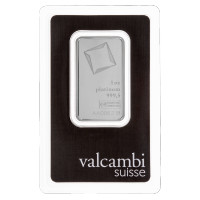 The flaming pearl featured on the reverse is almost as common a symbol as the dragons in Chinese culture and represents the elusive properties of wisdom, spirituality and prosperity. Secure your own prosperity today and fortify your holdings with a 5 oz 2018 Niue Double Dragon silver coin today!